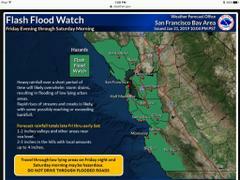 WEATHER ADVISORY: National Weather Service has issued a High Wind Warning and Flash Flood Warning through 10 am Sat. With the heavy weather expected to impact the East Bay this afternoon/evening, the National Weather Service has issued a High Wind Warning and a Flash Flood warning. Residents are encouraged to use extra caution when out during the storm. When driving, avoid standing water on roadways and allow yourself extra time to get to your destination.